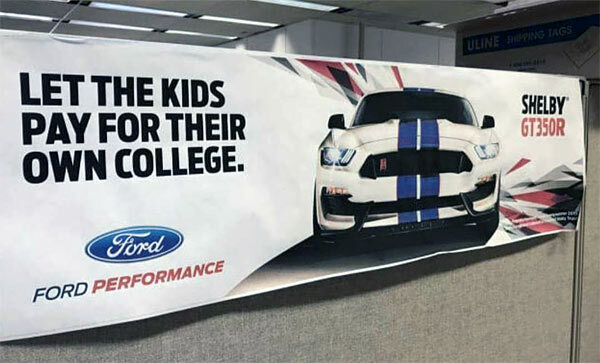 Shelby GT350R: Let The Kids Pay For Their Own College! Admit it, you have at least thought about this. That car of your dreams parked on the drive or the kids going off partying, errr…getting a fine education for three years+. Joking aside, this is a banner recently posted on Facebook which at least makes you stop and think if you really could homeschool the kids………hmmmm……. Think about the benefits, you will have a rather tasty Shelby GT350R sat on the driveway, home schooling means you will have advanced teaching skills at the end of it and you’ll know that the kids aren’t getting up to mischief as they will be indoors all day studying hard. You can further justify it by saying that you can go get them basic college supplies far faster than in a regular vehicle. Even as a treat if they do well enough in their homeschooling, there will be allowed to sit in the GT350R for a few minutes at the end of their studies. Its a win, win situation. Related ItemsShelby GT350R: Let The Kids Pay For Their Own College!